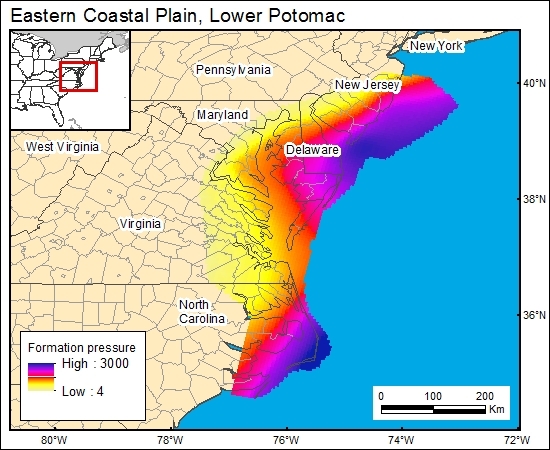 Hansen (1984) and Trapp and others (1984) provided discussions of pressure gradients for the lower Potomac Group (Waste Gate Formation) of eastern Maryland. They found that observed pressures generally follow a normal lithostatic pressure gradient of 0.45 psi/ft. To derive a pressure distribution map for the GIS, we took the 0.45 psi/ft and multiplied the depth to the top of the lower Potomac aquifer (c12bpotomac).